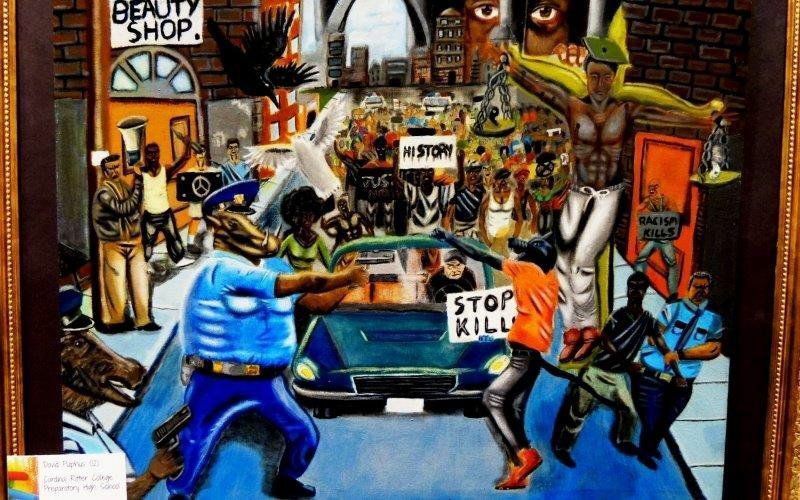 The untitled painting by 18-year-old David Pulphus, a recent high school graduate, depicts a protest march foregrounded by a police officer aiming his weapon at an unarmed subject. Two officers in the painting are depicted as boars. The painting was chosen along with seven others from Missouri to hang for one year in an underground tunnel connecting the Longworth House Office Building to other parts of the U.S. Capitol complex. This is this young man’s collective experience, and what he has dealt with on a daily basis in his community, and so he expressed that on canvas. Yes, some people find it offensive. I don’t find it offensive. I find it to be an expression of what one of my constituents is feeling about what he has experienced. In a week during which Congressional representatives took an oath to “support and defend the Constitution of the United States,” thanks to Rep. Clay for staying true to his words!